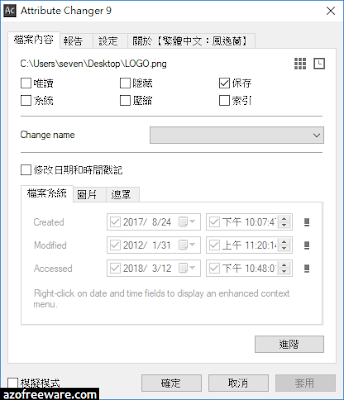 Attribute Changer is a power user tool to change all kind of file and folder attributes, date, time and even NTFS compression. Basic features include changing file and folder attributes within en masse. A really useful feature is the compression/decompression of files stored on the Windows NT/2000 and XP NTFS file system. Furthermore, date and time on files and folders can be partially changed. In this case, you can advise Attribute Changer not to change the whole object data, but only parts such as day, month, year, seconds, minutes or hours. The progress can be monitored in realtime on the "Activity and Results" tab. Filters and exceptions should be used to fine tune the process. Filters include attributes, size, date and time while exceptions are used to filter out files and directory entries using wildcards (* and ? ).